Kiryat Yam (Hebrew: קִרְיַת יָם, lit. Sea Town; Arabic: كريات يام‎) is a city in the Haifa Bay district of Israel, 12 km (7 mi) north of Haifa. One of a group of Haifa suburbs known as the Krayot, it is located on the Mediterranean coast, between Kiryat Haim and the Tzur Shalom industrial area, east of Kiryat Motzkin. In 2017 it had a population of 39,710. A large tract of land on the Haifa Bay was purchased from the Sursock family of Beirut by the American Zion Commonwealth in 1925. In 1928, the Bayside Land Corporation, a joint venture of the Palestine Economic Corporation and the Jewish National Fund, acquired 2,400 dunams of residential land in a deal related to the building of the IPC oil pipeline. Development of a residential area began in 1939, and the first houses were completed in 1940. Kiryat Yam has a population of 38,945. The northern area of the city is home to many immigrants from the former Soviet Union, North Africa and Ethiopia in which the municipality and its mayor Shmuel Sisso worked to build dozens of centers and homes to help the immigrants settle. The city is ranked medium on the socio-economic scale. Kiryat Yam has 15 preschools, eight elementary schools and 3 high schools (Rabin, Rodman & Levinson) with a student population of 10,000. During the 2006 Lebanon War, Kiryat Yam was hit by Hezbollah rockets and suffered casualties and property damage. In February 2008, a Google Earth user added an erroneous note that Kiryat Yam had been built on the ruins of Arab Ghawarina, an abandoned Arab village. The town filed a complaint with the police against Google for libel. Urban development plans aimed at upgrading the old Gimmel neighborhood were blocked by Rafael Advanced Defense Systems, whose main weapons development plant borders Kiryat Yam. In 2009, the Haifa district planning committee approved high-rise construction for the neighborhood, overruling Rafael's objections. Wikimedia Commons has media related to Kiryat Yam. ^ * Glass, Joseph B. (2002). From new Zion to old Zion : American Jewish immigration and settlement in Palestine, 1917 - 1939. Wayne State University Press. p. 192. ^ "Kiryat Yam Profile CBS". ^ Einav, Hagai (2006-08-05). 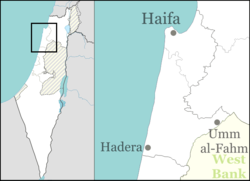 "Western Galilee: 3 women killed in rocket attack". Ynetnews. Retrieved 2009-03-04. ^ Glickman, Eitan; Shlomi, Ro'i (2008-02-11). "Kiryat Yam is Searching Google". Yedioth Ahronoth. This page was last edited on 17 January 2019, at 08:49 (UTC).